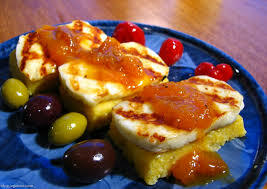 Halloumi is a sort of white cheese traditionally made and originated in Cyprus during the period of Byzantine Empire and it is a basic component of the Mediterranean diet. In the course of the time the cheese has spread over the eastern territories of the Mediterranean Sea and subsequently gained acknowledgement by the entire world since it is a basic component of the Med diet. Traditionally the ingredients of Halloumi are either goat or sheep unpasteurized milk. It is a semi-soft chewy white cheese. It is found in the basic category of the Mediterranean diet that can be eaten daily. The cheese has a specific layered texture, nice milky, tangy and salty flavor. Halloumi is packed with the brine, a liquid in which it is drifting while getting ready. The brine is a well known natural preservative from the ancient times. It is a valuable proof of an organic origin of the product. Quite often Halloumi is accompanied by mint leaves which contribute not only to an aesthetic view and great taste perceptions but also expands the aging time of the cheese due to their preservative properties. The cheese from the first sight is looks like mozzarella and many people try to compare them. However Halloumi has its own unique taste and ingenious features. Despite cheese is attributed to the line of the products with a short shelf time, Halloumi is not noticed in this list. It can be kept for up to a year if frozen below -18°C and defrosted to +4°C preserving the best properties in the area of taste and sight (which are valued the most by strict and demanding consumers). Another advantage of Halloumi is its diverse culinary potential. First, Halloumi has an unusual for white cheese cooking feature: it has the highest melting point. It allows the cheese to be processed by high temperatures without melting down. Apart from the fact that is can be eaten raw, it could be fried, or grilled, or crisped in the pan filled with olive oil and cooked anyhow and anyway your imagination may inspire you. Second, Halloumi is a fantastic garnish, a main ingredient and just a starter at every festive or ordinary table. It is served separately, as a component of salads, sandwiches, roasted vegetables and cover of a pita forming a lovely pizza. It could be fried in coating of bread crumbs and flour. It has a perfect match even with deserts: some spoons of your favorite jam are a nice company for grilled slices of Halloumi. Cypriots when entering the hottest season of the year prefer to indulge themselves with a salty Halloumi and refreshing sweet watermelon. Shortly, Halloumi pairs with any ingredient: tomatoes, olives, beans, crispy bread, pita, etc. It is a tool to get rid of hunger and to have a delicious meal. Fortunately nowadays any person worldwide gains an opportunity to buy and eat Halloumi and experience its tangy and creamy taste. It has become available after establishing its production on the commercial basis not only by the Cyprus plants but by the enterprises of other countries and continents. Since 1990 Halloumi was registered as a protected Cypriot product over the territory of the USA other than in EU. The delay in EU registration procedures is due to the debates between dairy producers and sheep and goat farmers. The grain of their conflict is whether Halloumi will contain cow’s milk and if yes, what will be a proportion toward goat or sheep’s milk. The issue is that by stepping to the path of mass production both the taste and properties have a little bit changed. Modern producers add cow’s milk in order to make the flavor of the cheese milder, eliminating strong tang. In such a way industries cut their expenses and offer consumers more common cheese. Meanwhile Halloumi is losing its aforementioned traditional properties and benefits. Thus to have a right impression of Halloumi cheese in its original and traditional form, it must be better to go to Cyprus if possible to a small village and to experience versatile flavor of traditional cheese – Halloumi.